The LG X Power is already available in the US via Cricket, but major carrier Sprint announced it has added the budget-friendly Android smartphone to its portfolio as well. 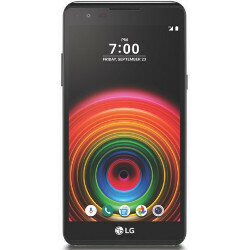 Furthermore, customers will be able to purchase the LG X Power at Sprint's no-contract brand Boost Mobile for just $129.99 (plus tax). Beginning September 23, it will be available at Sprint via Installment Billing, which means you'll own the handset after completing the monthly payments. It's also worth noting that for qualified customers, X Power will be available for $0 down (plus tax) and $9 per month for 24 months. The only thing that could set the X Power apart from other smartphones in the same price range is the huge 4,100 mAh non-removable battery, which is rated by LG for 33 hours of talk time. The rest of the phone's specs are far from being impressive, but that's perfectly understandable considering the X Power's low price. If you plan on getting this entry-level phone, then you should know that it sports a 5.3-inch display that supports HD (720p) resolution. It's powered by a 1.8GHz octa-core MediaTek MT6755M processor, coupled with 2GB of RAM and 16GB of internal memory. Actual storage varies, so if you grab the Sprint version you'll end up with 8.9GB usable onboard memory, while Boost Mobile's model offers 9.48GB of free internal memory. The good news is the smartphone is compatible with up to 128GB microSD cards. The back side of the LG X Power features an 8-megapixel photo snapper with LED flash, whereas in the front there's a secondary 5-megapixel camera for selfies and video calls. LG X Power supports Sprint's LTE+ network thanks to the MediaTek chipset inside. Also, it ships with Android 6.0 Marshmallow right out of the box. If you want to know more about the smartphone, you can check out our full LG X Power review.